You can use this page to verify that Yelp vouchers are valid and have not yet been redeemed. 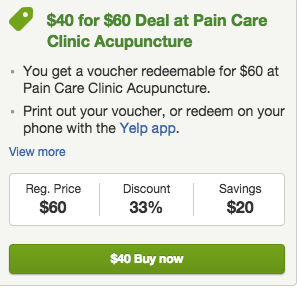 You get a voucher redeemable for $60 at Pain Care Clinic Acupuncture. Promotion lasts for 1 year from date of purchase. After that period, your voucher is redeemable for the amount you paid, less any value you may have received. Not valid with other vouchers, certificates, or offers. Voucher can only be used for services, not retail products. Only 1 voucher(s) can be purchased and redeemed per person. Up to 3 can be purchased as gifts for others. Subject to the General Terms.